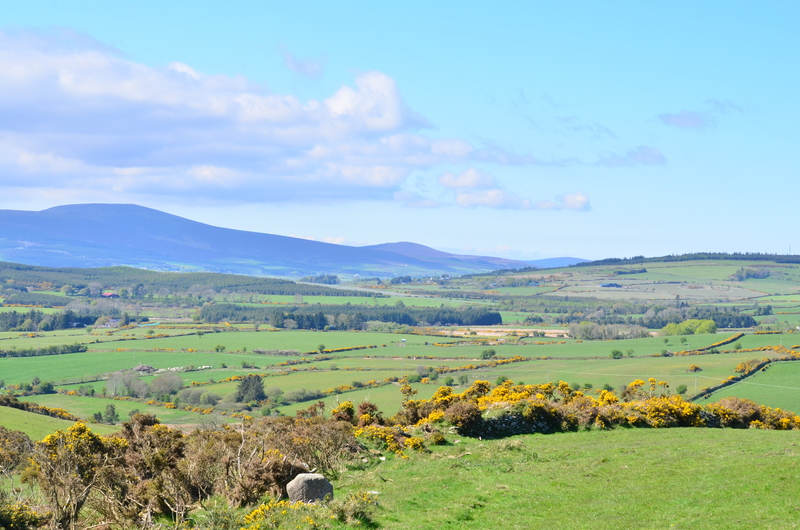 Summer in all her luscious lovlieness had arrived and as my car wound its way up through the hills behind Ashford county Wicklow, I rolled down the window and inhaled that wonderful coconut scent of wild gorse in bloom. The wind scorched fields and bare trees of a very long cold Spring had gone. Now it was as if nature had opened her box of paints and spilled them in delightful disarray all over the countryside. I turned the car off the road, shifted down gears again and climbed on up a narrow track which took me into the farmyard of Mr David Barron’s home, Carrowbawn. This was the venue for today’s working test. Organised by the All Ireland Retriever Club under the capable guidance of Mrs Jean Johnston and the Judges were Mr J Perry and Mr E Lennon. 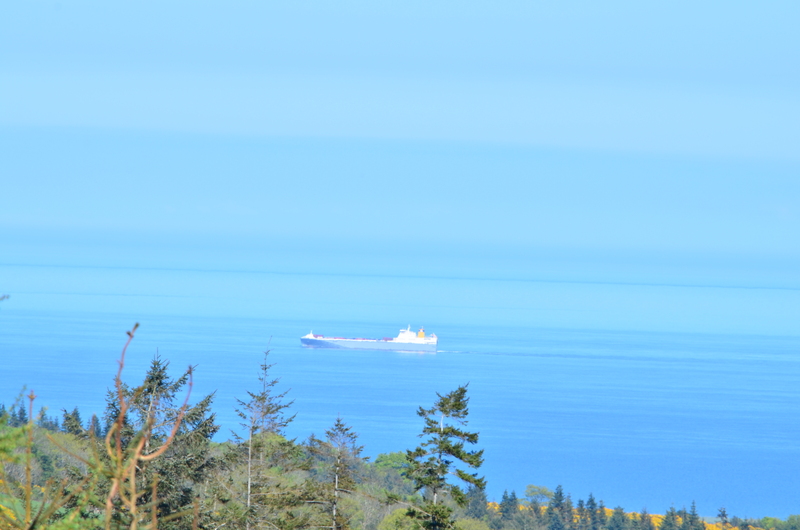 If everything went pear-shaped in regards to dog work, disappointment would soon be forgotten when I gazed out past the flowering gorse to the expanse of Irish sea below. It has got to be one of the most breath-taking venues to hold a working test. The first test that afternoon saw us sitting in an eight dog line up for a simulated drive. This type of test is becoming increasingly common and it is an aspect of Bertie’s training which I have worked hard on throughout the past year. So far this Summer we have sat through 3 such tests and he has coped well. He used to have a habit of counting dogs and creeping in anticipation when he knew it was his turn but so far this year his line manners have been impeccable, no moving and quiet. Today’s test would take him to the edge though. The dogs faced a plantation of conifers separated by a low stone wall. Once the drive was in progress beaters came through the woods toward us, shots were fired and dummies thrown over the wall in front of us. As if that wasn’t enough two bolting rabbits were then released in front of the dogs. One dog, sitting next to Bertie, was caught off guard with this development and ran in. Bertie lifted his rear but moved no further and remained in suspended animation for the remainder of the drive. 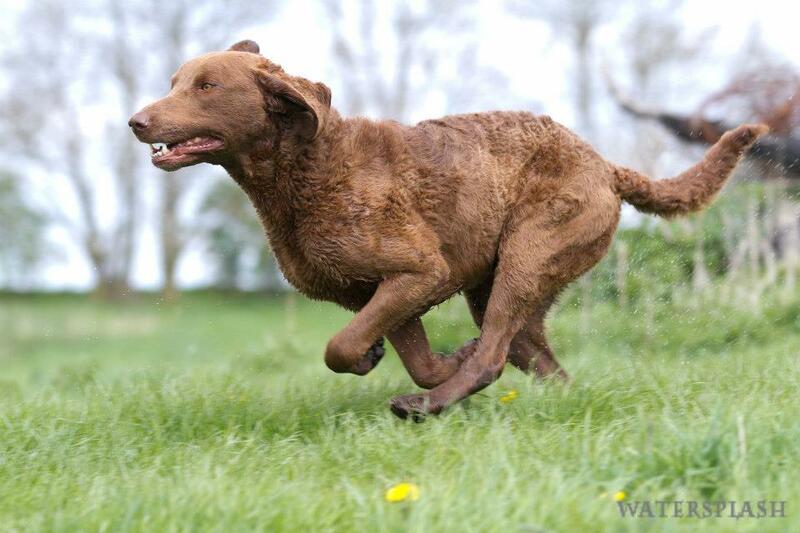 This was purely a test in steadiness with no retrieve required. The second test was a blind and diversion….with a twist. The dogs were taken one at a time. We stood on top of a hill. The field below was bordered by a stone wall, with banks of gorse. There were spots in the wall which were possible for the dogs to get through BUT the test was set in such a way that the only realistic route was through a gate directly in front of your dog, the blind was laid in the top left hand corner of the second field about a hundred meters on from the gate. The complication was the extremely tight angle between the gate and where the diversion was thrown among a cluster of decoys, just feet from the gateway. There was not the option of casting your dog left to avoid this temptation as there was a second blind to be retrieved up a track behind gorse and along the wall after the first had been retrieved. This was going to be tricky. I inhaled deeply and cast Bertie directly to the gate. As I anticipated, he did what I would expect him to do in the shooting field and clear game as he came upon it. He was taking a line directly for those decoys. I let him have his head until he was within ten feet or so then blew him up and cast him left. He wasn’t convinced at first and took another few strides towards the decoys. I stepped on the whistle again and with a very definite cast left he went through the gate. I pushed him straight back up the hill, then stopped him and cast him left again. He caught the scent on the wind and found the dummy. That retrieve alone was sooo worth it. The second part was easier, casting him well clear of the decoys he took the line well left of the gate disappeared behind the gorse amd emerged with the dummy. Third retrieve again consisted of a double blind but straightforward and no problems. There’s always one though, isn’t there? The fourth retrieve that afternoon was the one that saw the undoing of many…..
Again we found ourselves on top of that hill. This time the blind was laid across the wall and up to the right of the second field. Directly in front of us was a lovely gap in the wall, perfect for sending your dog through then cast right and he would use the wall to push on up the hill. However, on this occasion three dummies had been placed in clear view just beyond that gap and they were not to be touched ( I also found out later that there were dummies laid behind the wall which were not to be touched). I knew this time the momentum carrying him downhill and straight through that gap would be too much to stop him in time so I opted for the alternative. It wasn’t possible to send him straight to the corner as the field was bordered with a thick bank of gorse. I sent him to the edge of the gorse and then cast him right up a track that ran along the wall. At this point it was impossible to see my dog, I hoped he would appear at the top of the field where there was a low section in the wall and I could send him over. He reappeared at the bottom of the gorse, I cast him again and urged him with a verbal ‘get-on’ to re-enforce what was needed. It worked. When he appeared at the top of the field I sent him over the wall, a little hunt up and he found the dummy. I exhaled and laughed in relief and disbelief…I truly love what this dog does sometimes…. Fifth retrieve was a long single seen and finally after a long hot day our final retrieve was a water mark…a really lovely way for all the dogs to finish on a good note. We got lucky that day, Bertie finished second but my satisfaction came more from succeeding in two very technical retrieves. Chesapeakes are a breed that like to use their own initive. They don’t like to be told too many times which direction to go in relation to gamefinding, once is generally enough. Indeed it is certainly where they excel when wildfowling and that ability to figure things out for themselves is often a handicap when applied to working tests. What I love about this dog is that he still manages to retain that chessie attitude as you saw in relation to going forward for that diversion because he believed that was the right thing to do at the time BUT he is willing to forgo that urge to do what I wish without caving if over-handled and that is what makes him different. 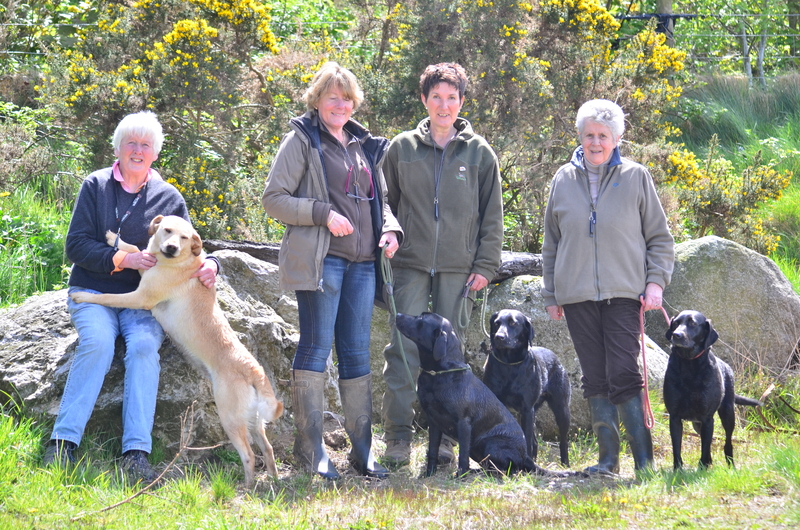 This entry was tagged nature, publishers, retrievers, short post, working gundogs. Bookmark the permalink. when working them on the real thing ,for me a great shot is good something to always remember ,but a hard and difficult retrieve from my dog sticks with me forever even long after they are gone ! 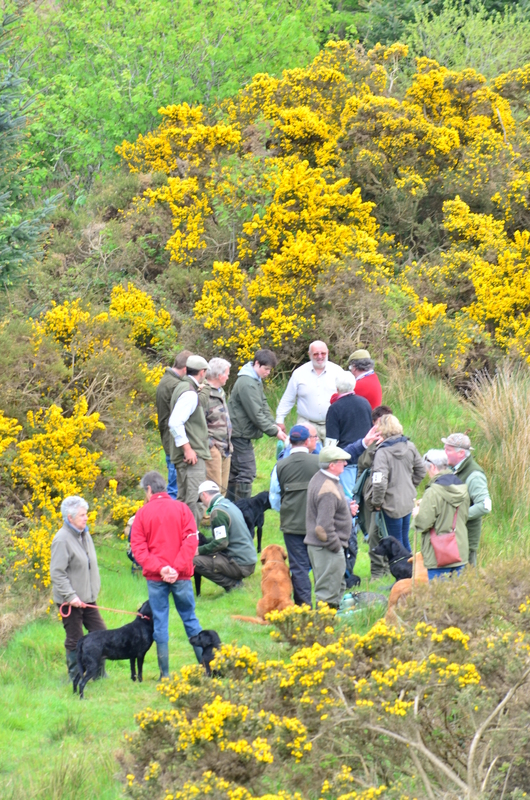 Once again I feel I was stood in Ashford County Wicklow with the rest of the spectators soaking up the sun, breathing the sea air and watching some great Gun dog work. Once again thank you to Bertie and yourself for allowing us to be there with you both Mary. Another great day had by you both, you can feel the admiration you have for Bertie in your writing of the days events and how he as pleased you. Truly a brilliant day for one lady and her dog. Thank you Mary for once again allowing me to be able to join you both on this great day out. Even if it is just by reading your blog I was there. My mum (the pawed kind) was from the UK, so I thought it only fitting that I should share my Award with y’all! Stop by todays post (27 June 2013) and pick it up. Love the picture of Bertie!